"The Patriots Are Great. Deal With It." Charles Pierce at Slate.com argues that the American football world will just have to deal with the Patriots, now they have nearly sealed their amazing, record-setting season. We will never see anything this in the NFL ever again. They are ludicrously better than 30 of the other teams in the league...And, best of all, they make all the right people angry. That list starts, as it must, with the surviving members of the undefeated 1972 Miami Dolphins, who decided years ago to break the world record for being publicly grumpy old farts, a mark previously held jointly by the McLaughlin Group and any show Louis Rukeyser hosted alone. Bob Kuechenberg's opinion has been almost universally unsought for more than three decades, and the last person who truly cared what Mercury Morris said about anything was a judge. 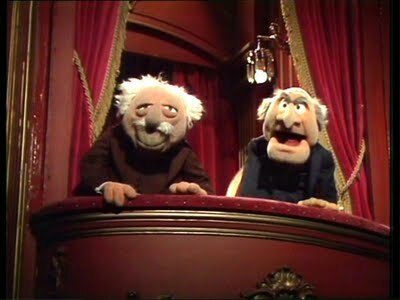 Yet, all season, the Patriots found themselves heckled by the NFL equivalents of Statler and Waldorf from the old Muppet Show. Go down to the Metamucil section of South Beach, the lot of you, and shut up. I juts returned to the office to learn that the Redskins have made the playoffs. That's a good story, too. But what the hell is this? 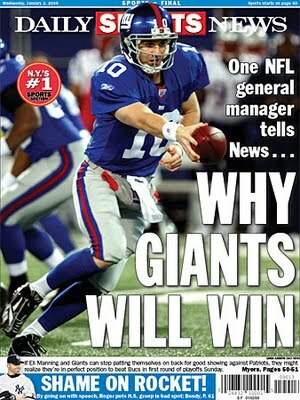 What will the Giants win, exactly? Their next game? Well yes, they should. But that might be all. 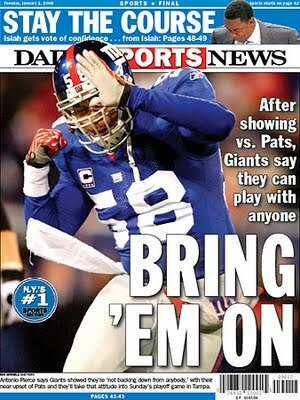 Bring on Tampa? All righty then.